Christina Angelina a k a Starfighter, is a Los Angeles based visual artist, photographer and gallerist. She´s internationally renowned for her public art and large-scale figurative murals. 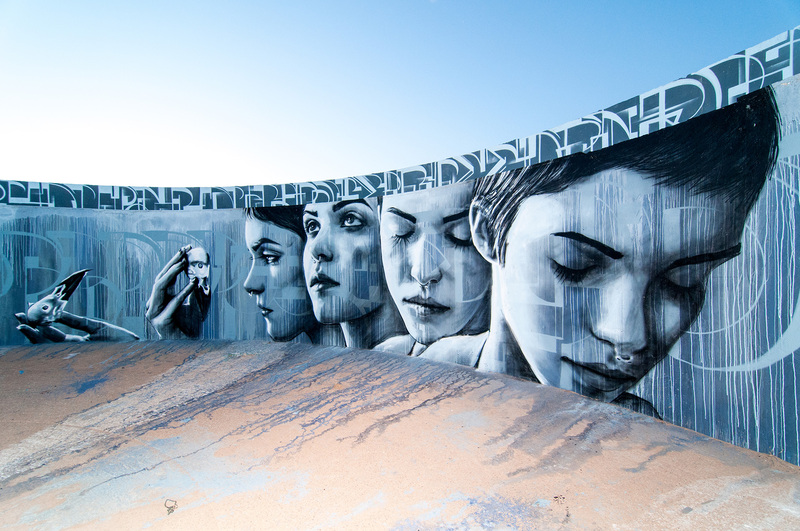 She was one of the featured artists in Google Art Project´s Street-Art Collection and in 2015 Huffington Post cited the collaboration with Fin DAC in Sao Paolo as one of the ”Most influential Acts of Street-Art around the world”. Growing up in the Venice neighborhood of Los Angeles, California, Angelina was surrounded by performers on the boardwalk, caricaturist creating sketches and muralists painting on walls in alleyways. Inspired by the creativity of the communitiy, she began painting when she was a teenager, selling prints to friends and local art collectors. Angelina received a Bacherlor´s of Fine Arts in Art from UCLA in addition to studying animation at NYU´s Tisch School of the Arts and Photography at the Art Center College of Design. After graduating college, Angelina worked in a variety of media including drawing, painting and graphic design before homing in on the Street-Art and adopting the public persona ”Starfighter”. – Christina Angelina is like a rocket on the Street-Art heaven. She has done pretty much everything in art forms from commercial installations to giant commission pieces, to burning man and collaborations with a lot of other really great street artists. I love her natural figurative murals and really look forward to see her paint in Borås, says Shai Dahan, curator of No Limit Street Art. – I also find her work and the range of her artistry really impressive. Even though her works usually consists of very few colors, she succeeds in creating an incredibly wide spectrum with a photorealistic look to it. I think her piece in Borås will be amazing, says Stina Hallhagen, project manager. James M. Rizzi known better as JM Rizzi is a Dallas-based artist whose artwork is influenced by Abstract Expressionism, executed with a Neo-Contemporary twist. Born in Brooklyn, NY in 1975, JM Rizzi discovered his love for art at an early age. 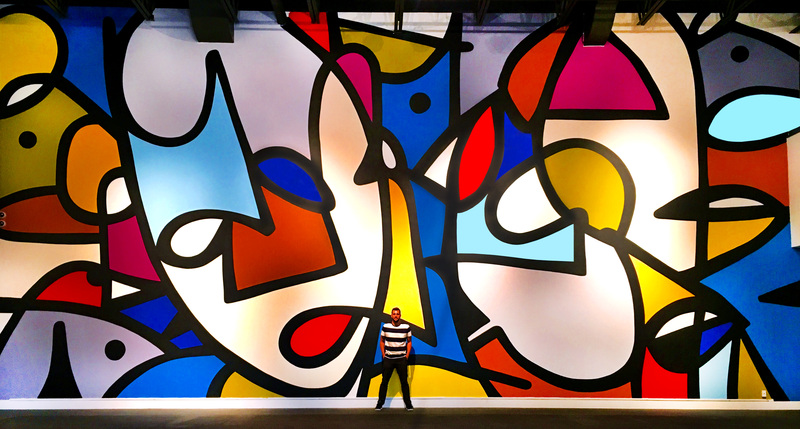 Shaped by the raw energy of the city and following in the footsteps of the pioneers of street art, Rizzi pursued a degree in Fine Art from the School of Visual Arts, graduating in 1997. 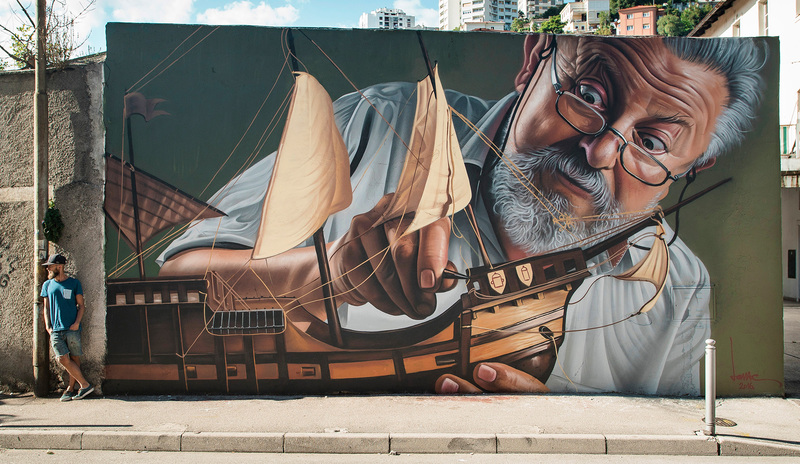 In the years that followed, he took to the streets, adding his colorful interpretations to the urban landscape. 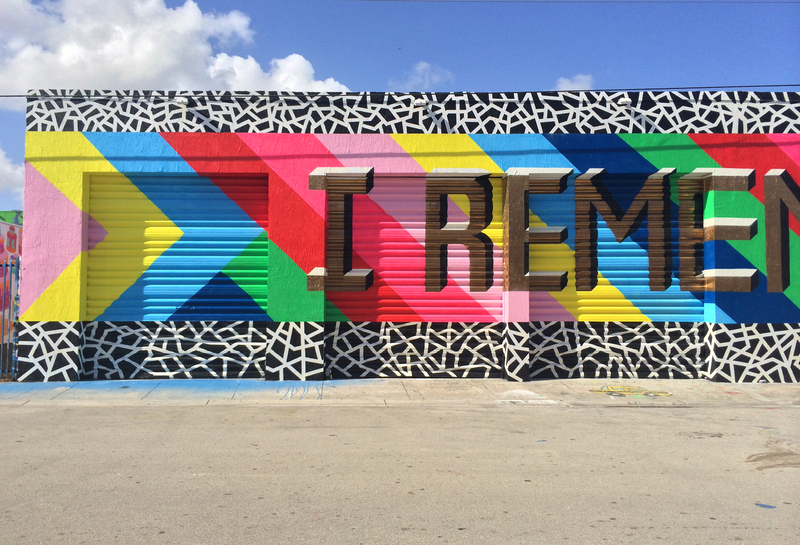 Establishing a strong name in both street art and fine art, JM Rizzi’s imagery has become iconic in his native New York City as well as Dallas, where he currently resides. With major commissioned projects around the globe, his work can be found in NYC, San Francisco, Los Angeles, Chicago, Hong Kong, and Shanghai. With a determined statement on motion, scale and color, JM Rizzi composes a magical symphony of shapes and forms, all pulsating into one another. His paintings are both serious and sensual while never sacrificing the energy and fearless that he’s become known for. These are the works of a mature painter in his prime. – I just love the amazing colors of JMR, it has got a very unique kind of enamel luster with sharp abstract lines and smooth shadings. A perfect combination of graffiti and expressionist painting, it´s like the best of both worlds, says Shai Dahan, curator of No Limit Street Art. – The colors of JMR will really stand out in the streets of Borås. The pieces are really exciting and joyfull and I´m happy to bring more balance between imaginative and abstract art in No Limit, says Stina Hallhagen, project manager. Lakwena Maciver is a London-based artist exhibiting work internationally, both in galleries and in the public environment. Her work is inspired by adornment, and its use and power as a means of communication. Informed by decoration both aesthetically and conceptually, she explores the messages that decoration is used to communicate, its traditional use in worship and myth-making and how this translates into contemporary popular culture. Concerned with the significance of how and who we decorate, and what this reflects about our values and beliefs, Lakwena positions kaleidoscopic colours, bold pattern and adornment as powerful signifiers to redefine and reassign value and glory. 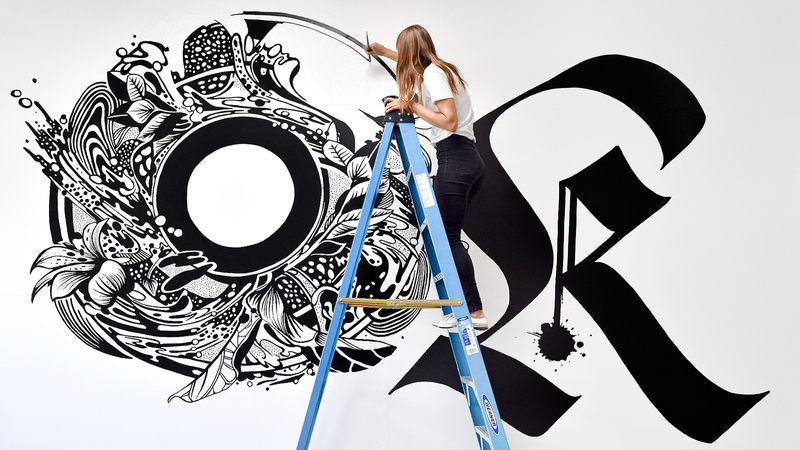 Using words as both images and as anchors of meaning, she borrows from the techniques and conventions of traditional sign-writing and contemporary graphic design. – I first saw her work when I was painting for Art Basel in Miami in 2013. I watched her do a big mural there and fell in love with her work. After briefly meeting her, and talking to her about her work ethics, she was an obvious choice for us, says Shai Dahan, curator of No Limit Street Art. – I´m so happy to have Lakwena in our line up. This year we really managed to get a wide range of styles. The work she makes is so colorful and despite it´s really cheerful it also has a deeper meaning in the messages. I love how she combines these important messages with the vibrant colors and massive typography and graphic forms, says Stina Hallhagen, project manager. The festival for 2017 is over but we offer guided tours among illuminated art in Borås (both Sculptures and Street Art) until late February 2018..
To ensure the qulity of our guided tours we accept groups no larger than 50 participants in each. Therefor we kindly ask you to contact us directly, for booking of larger groups, school classes etc, tourist@boras.com, +46 33 35 70 90. We enhance the range of tours as the reservation grade gets high on the existing tours.